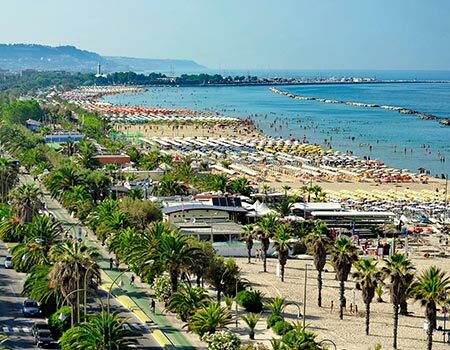 San Benedetto del Tronto is a 50.000 inhabitants city on the Riviera delle Palme, so called due to its 7.000 palms, an emblem of the city, that feature the promenade, and it is one of the widest and majestic in Italy. 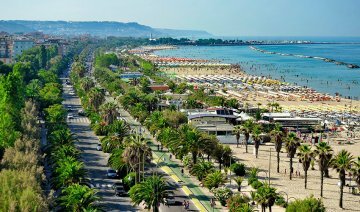 The city is yearly visited by a lot of tourists coming from any corner of Europe and it is one of the main bathing cities on the Adriatic Sea and has also the biggest fishing harbor in Italy. From 1999 the city has always been awarded with the Blue Flag by the FEE (Foundation for Environmental Education), that is released to the bathing cities in Europe that satisfy some criteria such as that one of the cleaning of the beach. 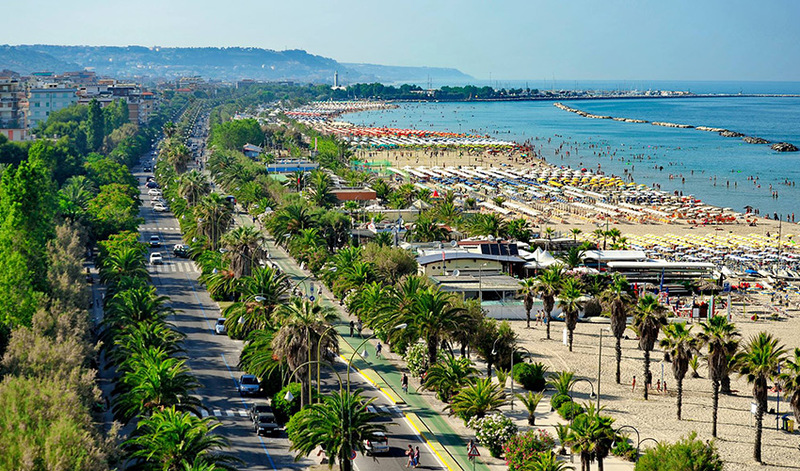 The promenade in San Benedetto del Tronto has been recently restored at the South with the extension of the bicycle path, that goes up to Cupra Marittina, and the pedestrian area with the making of themed gardens (children garden, Mediterranean garden, multisensorial garden...), natural spaces on the sea with direct access to the beach. It is 6 km about long and it is coasted by gardens, pine woods, tennis fields, a skating lane, a lot of bathing resorts and accommodations. To enjoy at its best the city, nothing is better than by bicycle. The 5 km long path allows to go from one side of the city to another in such an easy and funny way! 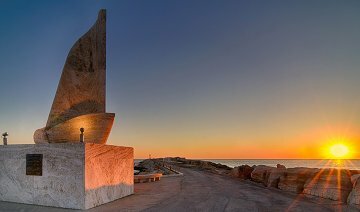 San Benedetto has also an ancient village in the highest part of the city that is featured by the Dei Gualtieri Tower, also known as the "Torrione", emblem of the city with its clock on the side that overlooks the sea and that overlooks all the city. The Boulevard "Secondo Moretti" , the historical "corso" of San Benedetto, recently restored, in the center of the pedestrian area, is the main hangout for the Sanbenedettese people: here are hosted a lot of bar, boutiques, and any other kind of shops. 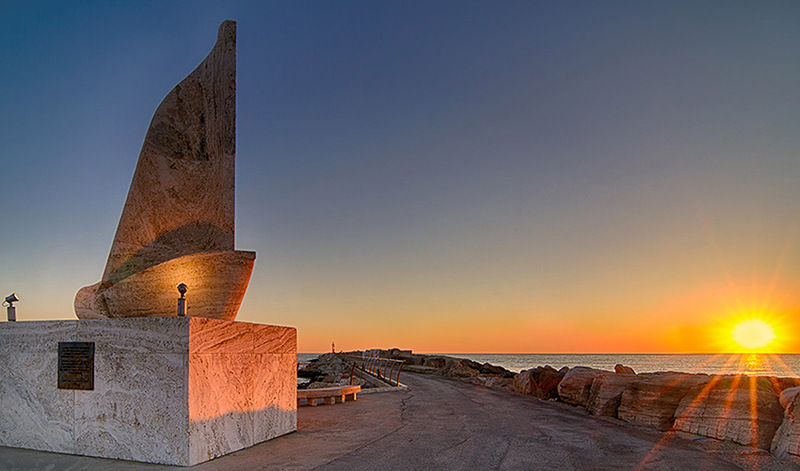 By some years, the promenade has been embellished by a collection of modern art masterpieces, above all sculptures, by Ugo Nespolo, Enrico Baj, Mark Kostabi, Paolo Consorti, Marco Lodola, Paolo Annibali.